Battlefield Hardline is the hot cops 'n' robbers currently in development, especially with the multiplayer beta running next week, but for my money This Is the Police sounds far more intriguing. You play as Jack Boyd, a 60-year-old cop on the verge of forced retirement, with nothing to show for his years of service but a bald spot, a bad back, a moved-in mother-in-law, and three kids who are about to bury him with tuition fees. He's frustrated, he's angry, he's got 180 days to set himself up for the future—and he's not playing by the rules anymore. Except he does have to play by the rules, sort of: He can take bribes, cook the books, sell guns or drugs on the side, and indulge in all sorts of other bad behavior, but as the chief of police he still needs to stay on top of the day-to-day operations of his force. Which, for the record, doesn't sound like a particularly solid unit: Corruption abounds, from rank-and-file officers all the way up to the Mayor himself. The Kickstarter describes the game as a "strategy/adventure," and says the focus is on "ensuring that everything that happens on the screen is an important part of the story. You won’t get bogged down with the numbers and the attributes of your units, and it’s not just a set of puzzles to solve. As you move from one event to the next, the city of Freeburg will change around you, in response to your actions. The story is not constrained by a particular genre or narrative format, so you can truly take part in the life of a desperate man trying to regain his self-esteem." It sounds like there's potential for some dark comedy here, especially given the presence of voice actor Jon St. John, best known as the voice of Duke Nukem. 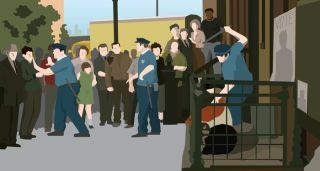 But there also appears to be a very serious edge to it as well, as illustrated by a screenshot on the Kickstarter page referencing a planned protest in the city: Since most of the protesters are expected to be black, Boyd is being ordered to pull all black officers from duty that day, and to come down hard on protest ringleaders. It obviously isn't the sort of "cop experience" you're going to get from a major studio release—but that's a big part of the appeal. This Is the Police is the first game from Minsk-based studio Weappy, which has thus far raised about $7500 of its $25,000 Kickstarter goal. If the campaign is successful, the game is expected to be ready by the end of the year.